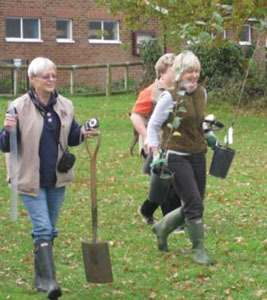 After more than 12 months of careful planning, an usually warm November 12th in 2011 saw volunteers, both young and old, getting to grips with planting and protecting the 40 fruit trees (2 Quince, 1 Greengage, 1 Plum, 4 Pear and 32 Apple) that now make up the Swallowfield Parish Community Orchard which is situated next to the Riseley Village Tea Room. The names and location of each tree were carefully recorded so that, as they start to mature, they can be easily identified. With wonderful names like Hambledon Deux Ans, Mere de Menage and Eggleton Styre, the residents of Swallowfield Parish are, in future, going to be able to get part of their “Five-A-Day” from fruit not available in the supermarkets! 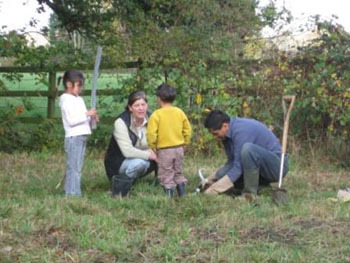 The Orchard project, which also includes sites at Wargrave, Twyford and Dinton Pastures was funded by National Lottery money and was secured by the Community Council for Berkshire as part of a healthy eating initiative. The project was, very much, designed as a means by which a link could be created between planting an orchard containing heritage varieties significant to their location, a facility to embrace the whole community, promotion of healthier eating and sites that would create the impetus for further events. Many of the fruits have a fascinating history and were individually selected for having connections with the Berkshire/Hampshire area. A great example of this historical connection is the “Golden Pippin” apple that has records going back to 1685 where it was recorded that Lord Clarendon's seat at Swallowfield Park, Berkshire had an orchard of 1000 Golden and other cider Pippins. One can only guess how much cider this actually produced! A great many of the apples that have now been planted had been lost to this area and, indeed, this country over the years. They have been resurrected by carefully grafting scion wood obtained from around the world such as the Grove Research Station in Tasmania (Eggleton Styre apple). The trees are in good condition and should start to put on significant growth in the coming months. As the site develops more wildlife will start to call the orchard home and, a recent survey at the site by The Berkshire Reptile Group, found Grass Snakes and Slow Worms were present in good numbers. The UK government places Traditional Orchards on its list of priority habitats for biodiversity as, sadly, it is believed that the area of orchard habitat across England has declined by more than 60% since the 1950’s. It is, very much hoped that, as well as interesting fruit being produced, it will become a fascinating habitat for many other species of plants and animals. So what are the plans for the future? A fully matured orchard does not happen overnight and there is still plenty to do. Soon an information sign will be placed at the orchard to help people identify and locate the different varieties as well as gain an insight into their historical significance within the area. It is hoped that the orchard will also act as a launch pad for other conservation-oriented projects and members of the community have already expressed interest in wildflower planting and bee keeping. 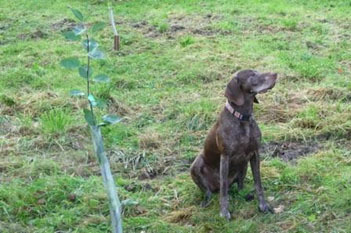 As the Riseley orchard develops, volunteers will be needed to help prune and maintain the site. Swallowfield Parish Council will hold events that bring all members of the community together to celebrate the link between our heritage and healthy eating. If anyone would like to like to join the orchardists (yes it is a word!) and help to maintain our community orchard or hold an event, please contact the Swallowfield Parish Clerk on 0118 988 5929 or clerk@swallowfieldpc.gov.uk. The area that is now the meadow was transferred to the Parish Council in the mid-1990s when the houses in Curly’s Way and The Naylors were built. Before then the area had been a coal yard and aerial view photographs show how ugly and barren the land was at that time. The Parish Council agreed to take ownership of the land (0.7 hectares) on behalf of the community. The Parish Council then cleared the land, carried out some tree planting and installed an hexagonal bench around a young tree. Since then, grants have been secured from ETB (Environmental Trust for Berks) and Wokingham District Council to enable the ditch to be cleared and widened as well as the planting of more trees, shrubs and wildflowers - much of this work being carried out by local volunteers. The culmination of all this was on 15th July 2003 when the area was officially designated as a Local Nature Reserve under the provisions of Sections 19 and 21 of the National Parks and Access to the Countryside Act 1949 (as amended). Today the meadow is a beautiful and tranquil place to take a stroll or simply sit on the hexagonal bench and read a book or watch the comings and goings of the birds. Pathways are cut in amongst the long grass during growing months to enable people to enjoy the meadow without destroying the wonderful variety of wild flowers. Swallowfield meadow has entrances at the end of Curly’s Way and along Part Lane.